This custom-made system transforms the Defender's mechanical directional switch into a comfortable switch with features often applied to modern premium vehicles. All that is needed to activate the direction indicator is a soft tick on the direction indicator knob to blink it at an adjustable time. This kit is plug and play with connectors that connect directly to the deflector's cable boom. There is no need for adjustment to the switch and / or the cable boom. The standard functions of the direction indicator will continue to work and the warning lights will remain intact! For maximum comfort, ease of use and compatibility with different indicator relays (eg LED relays), the microprocessor allows the user to adjust the system to a custom "blinker" time for the indicator in the standby mode, simply by programming this with the default indicator handle icm. 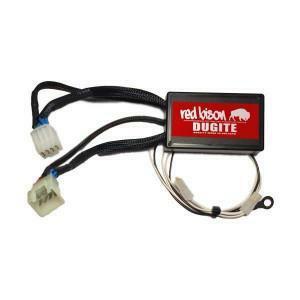 with the registered Red Bison single button multifunctional technology.